Was MJ's Doc a Mason? Discussion in 'General Freemasonry Discussion' started by Blake Bowden, Aug 24, 2009.
can't tell from that picture. possibly regular. I'd Google his name if I could remember it. I'd Google his name if I cared. fixt. pretty rough/rude fix though. I had read an article a while back that said he joined freemasonry for business contacts however I do not know the validity of this and can not find the article again. 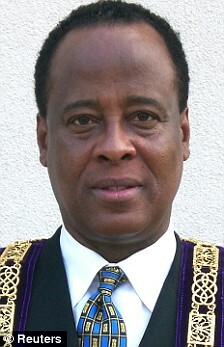 Dr. Murray has been a Freemason for three years according to the link below. If someone could read the tags below the jewel, I bet it would say. According to Chris Hodapp, somebody tracked down that he belongs to the "United Most Worshipful Scottish Rite Grand Lodge of Texas," with offices in Houston. A member of three years, he has arisen to the office of "Grand Medical Director." I find it intresting that MJ's Doctor would have any reason to kill the goose that laid the golden eggs. It also seems incredulous that he would in fact join the Masonic Grand Lodge of Prince Hall for business contacts, heck he was already a well established doctor with probably dozens of business contacts. The one thing I do understand is that MJ probably offered him a lot of money to become a personal physician to a famous and infamous pop star. I am not certain that It matters whether or not the Doctor was a Mason. who said PHA recognition is simple? WOW! I didn't know there were so many clandestine Lodges! Brother Bill , you are right, the same brush colors or tarrs all of us equally who profess to be Masons. I am in hopes that this man has done nothing to give us another black eye. That may be why the GLOT produces the book that tells us what lodges are recognized insted of the ones that are not. The book would probably be many times thicker. I recently read on the news that Michael Jackson's death has been categorized as a homicide due to the substances found in his body, it also looks like the doctor will be charged. First thing that came to my mind as well is the possible bad reputation to our craft. Last I heard (and this is thinking back and I could be wrong) is that this Doctor will more than likely not be charged but now they are investigating a second doctor. Who knows? I know that they need to get a better grip on doctors that prescibe this kind of medication. I personally know of someone that OD'd because she would go to one doctor then another and get pain medication. Sad thing is she sent my GF at the time to one of the same Dr. and she would get SAMPLES of deppression meds then there was NO supervision of the meds and she basically built a dependancy and when she went to a "GOOD" doctor she had to go into 14 in patient just like a Drug User because of the dependancy she had on the meds the other doctor (family doctor) prescribed. So here is my question, Why do we allow a general doctor to prescribe ALL meds? Should we make it to where if you go on long term meds you should seek a specialist first? Yes I am "in the field" but dont know all about it. I am familiar with many drug regulations. What you are describing is doc shopping. You have to remember the physician only knows what you tell them and they do not know if you are lying or not. No physician is going to write scrips that place a patient in danger or at risk for addiction without some presentation of symptoms or complaint by the patient. Granted, there are some physicians out there who will do anything for a buck, but those are few and far between. You asked about generalist physicians being able to write all drugs. Most physicians these days are Board Certified in something including Family Practice - they are not the General Practicioner from the days gone by. These physicians have more access to more knowledge than any physicians in the past (electronic PDRs, orders written from a PDA and delivered directly to the Pharmacy). Today the pharmacist is better trained, better equipped and is more a part of the process than ever before. The pharmacist has computer programs that can track patients across locations (docs do not), and they can notify physicians rapidly if something seems strange. More regulation is not needed, More limiting of access is not needed. The current metropolitan provision of care practice is to keep all you can at the Primary Care level - think referrals from HMOs. If you went to your doc, who determines what is wrong and what you need but turns to you and says - Mr. Josh, you are suffering from insomnia secondary to your stress of learing all your work for your A cert. I cannot help you because some guy from Lake Worth thought it would be a good idea to limit my access to treatments. We called the specialist, who is right next door, who I went to the same medical school with but took another test to get the drug stamp on his medical license. The good news? Your condition can be treated with one med and you will see immediate results and it will control this issue in little more than a week of treatment. The bad news? He can see you - - in 2 months, AND he will need to repeat the studies we have already done because by then they will be over 90 days old- - AND you will have taken your Cert exam 3 weeks before his first available appointment IF - you can get your insurance company to give you a referral. Not real practical and the issue you wrote about was not caused by, precipitated by or the fault of the physician - it was the patients who caused this problem. This has gone on forever - your kids even do it - "Dad can I have an Ice cream?" do you answer it (not being home all week and tickled they asked you) or do you say, "did you ask your Mother?" Same deal with the patient, except the physician has 600 kids, a staff of 7, a life and 30 different insurance company guidelines to follow and doesnt always think to ask. Perspective is a wonderful thing.